Webinars: CCAPS offers free webinars on a variety of topics to help you hone your business acumen. Catch up on past webinars, including "The Psychology of Change for Project Managers" presented on March 14. This certificate will give you up-to-date human resource practices at the technical, operational, and strategic management levels. 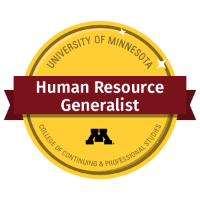 Whether you have HR experience or just want to build your career, our Human Resource Generalist Certificate is designed to prepare you for success. Not interested in a certificate? Courses can be taken individually. See the list of professional development courses. The College is now offering digital badges with the completion of a professional development certificate. Learn more about digital badges.